Lines Numeric Fun: free puzzle app for iphone, ipad. Also, my thoughts on ripoffs. John Adams has created an interesting set of topology type puzzles. Look at the first image: the objective is to cover all the squares from the starting square to the ending square. Make sure you fill up all the squares and of course the 1 square must come before the 2 square. You get the idea. I did those 24 levels very quickly. The green levels have 2 paths that must be connected simultaneously. Here's what's interesting: because there are 2 paths, there are two sets of numbers. You don't know which numbers are for the green path and which are for the orange path. These puzzles are more difficult. There are 24 blues levels where there are 3 paths. The 24 yellow levels have 4 paths! Very challenging and fun. Recently, a puzzle app developer was asking for my advice/opinion. I generally want to stay positive. However, since this game is a ripoff from https://play.google.com/store/apps/details?id=com.jadams.lines, I feel I can vent. So, let's talk about the negatives. First are the ads that will interrupt your game. Beyond annoying! Turn off the wifi! The graphics are old school. I'm not crazy about them. For example: the board does not fill up the screen. Why not take advantage of the full screen? I also don't like the font and have trouble distinguishing a 2 with a 3. Maybe I need reading glasses. Those complaints are really minor. I positively love these puzzles. Right now I've done 81 out of the 96 levels. According to my fellow puzzle app blogger Nicola this game was originally published here: https://play.google.com/store/apps/details?id=com.jadams.lines and that this game is a blatant clone. That's unfortunate. It also makes me not want to complete all of the levels. Or do I? The hard lesson for everybody who's developing a great puzzle: if your game is successful, there is a 100% certainty that you will be ripped off by cloners. There is no entity that will protect your intellectual property. Numeric Paranoia Space Dots are similar games. The former is better. The latter is easier and more colorful. Number Combine Puzzle is a rip-off of a pretty good puzzle called Even Up. I believe that Number Combine Puzzle has new puzzle levels. However, the author has totally taken the same graphics. C'mon! 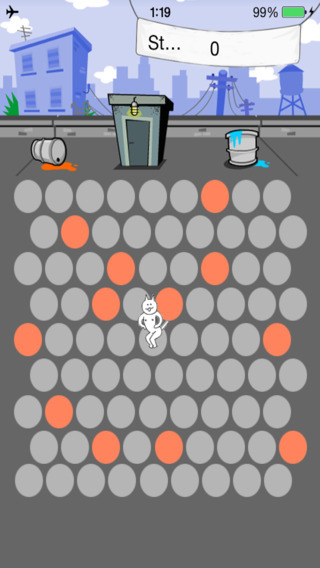 This is an excellent online puzzle game from Andrey Shevchuk. There are 48 puzzle levels to solve. It's a little similar to Perfect Paths, which I found to be very difficult. There are numerous puzzle apps that have been made in the past few weeks that copy every single detail. To my knowledge, Andrey has not published his own app. Kitty Gala has created a little dexterity game that's easy enough that I can do it. 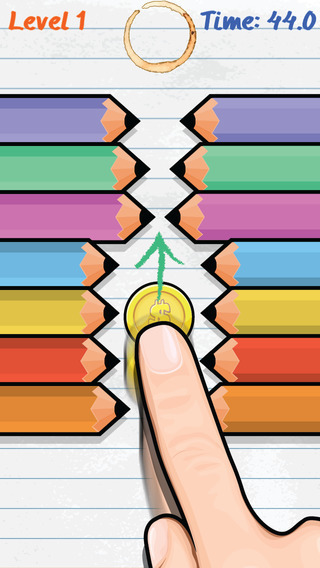 The pencils move back and forth and you must be very patient to move the coin to the top of the screen. I was stuck on level 13 and then saw that if I could get to level 17, I would shoot up the leaderboard significantly. Couple hours later, I'm on level 56 and am at the top of the leaderboard. My parents could cared less. There are 'hundreds' of levels. So I'm going to stop right now! •When we release the "Wechat" web version of this game, in 3 days, we got 5,000,000 users and 100,000,000 visits!This is AMAZING! Thank you! We are so happy to release the app version of the game. •Some medias call "Catch The Crazy Cat" "The Best Puzzle Game Ever"
•The rule of the game is very simple : try to use the orange blocks to surround the Crazy Cat, don't let him come close to the edges. This type of game has been around for ages. Who are these people calling it the best puzzle game ever? I played it twice. I'm guessing that some mathematician has done a study on this. Instinct is my strategy. 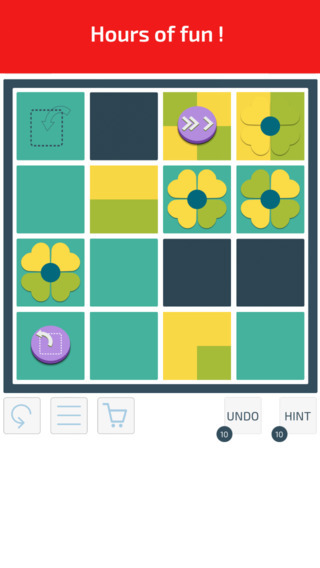 Boaz Ouriel from ZigZapps recently contacted me about his new puzzle app game: Petals: A Brain Teasing Puzzle. Petals is a 'slide all the tiles together' type puzzle. The object is to get the flowers to their matching squares. We've seen this type of puzzle app numerous times. However, Petals has some interesting new features. See the purple circle with the white curved arrow? A petal will rotate 90 degrees. Then the widget will disappear. Another widget makes the petal flip over to its mirror image. The first 96 levels are free. I've solved them all. Although I had to use a few hints. Within that, there's a good mixture of easy, medium & hard levels. And you can skip around - a feature I appreciate since I could not solve Daisy #11 - even though it's classified as medium. I confess, I used a hint for that one. Amedeo Tamburrino is the author of Click the Button which is very challenging. The objective is to get each button in a pushed-down state. If you click on yellow, then all of the yellow will change direction, some may go down, others will go up. If you click on a button that looks like an equal sign, two things happen. If it's blue, then all the blue buttons will change. Second, all the buttons in that row or column will shift too. Click the Button is a serious set of puzzles. My only qualm is the color scheme with the white background. Maybe the buttons that are still in an up position could be displayed in a more pronounced manner. 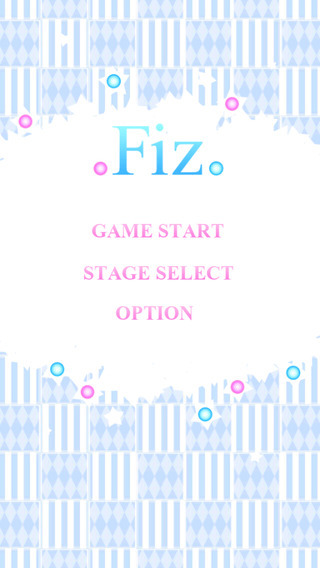 Nozomu Suzuki is the author of Fiz, a free puzzle app game for the iphone, ipad. The objective is to get all the discs to be either red or blue by jumping over each other. Look at the second image. See the red disc in the top right? Slide it toward the left - over the two blue discs. They will turn red. Then slide the third red disc on the second row to the right. An alternate solution is to turn everything blue. What makes Fiz interesting is that you never know whether it's easier to get a red solution or a blue solution. For the harder levels, only 1 solution exists. There are 50 levels and I'm stuck on level 45, which I'm convinced is impossible. I believe that I've tried every combination of moves. If you manage to solve 45 - send me the solution please. 8/26/14 Update: Andrew Juell,recently sent me the solution to level 45. Thanks! And now I've completed all 50 levels. I liked Fiz, but also feel relieved that there weren't too many levels. I like the sense of accomplishment. 21 Dice is a point scoring puzzle app that involves a little luck. 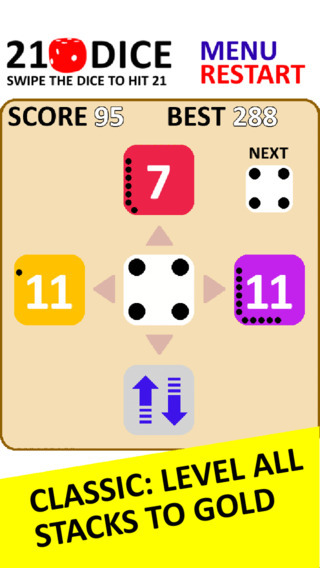 The object is to score 21 on each of the dice. The more times you do it, the higher your score. The first time a die reaches 21, you get 1 point. The next time, you will score 2. You get the idea. Pay attention: suppose a die has reached 21 for the 10th time. That die will not go back to zero, it will now start at 10. I was skeptical about this game. But I think it's pretty good. I've played it about 20 times now. My high score on the classic mode is 577. Which I think is pretty good. Right now there's no leaderboard. I got an email yesterday from my fellow puzzle app blogger Nicola Salmoria. He alerted me to this little masterpiece called 'Tapes - Simple & Minimal...' I dropped the other puzzle apps to focus on this one. Yohei Sato is the author and he gives no rules or explanations. The pictures tell the whole story: stretch & bend the ribbons to cover all the squares. The number on each ribbon indicates how many other squares it can cover. There are 72 levels and I solved them all. Tapes is reminiscent of Colorbind from 2010. Colorbind had a different objective and could be insanely difficult. But the ribbon concept first appeared there. Tapes has some easy levels; others are really tough. Without a doubt, Tapes makes it on to the List of Best Puzzle Apps of 2014. Reminder: that list will be published in December. Great job Yohei! The folks at http://ninemagics.com/ made Blockswipe last year, which I positively loved. Recently they contacted me about their new game Paths of Light. 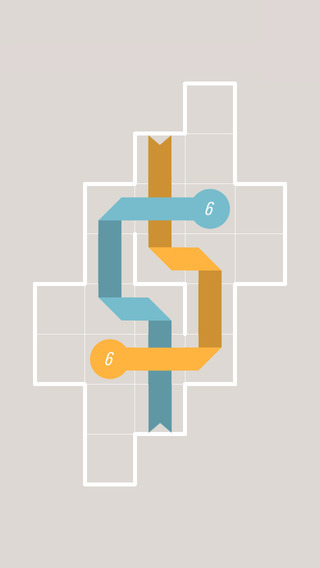 Paths of Light is a topology puzzle app game. You must swipe all the white tiles without lifting your finger. Start at the purple square and end on the yellow square. As you go over the white squares, they will turn blue. The red squares are portals. We've seen many puzzle apps like this before. What's different? The pink tile will shift back and forth when you land on it. A green tile allows you to land on it repeatedly. There's another element to this app: remember the puzzle 100 Floors? There's something similar here. I got nowhere on the first set of doors! Bottom Line: I like Paths of Light. But not as much as Blockswipe. ilabyrinte, also known as Le Labyrinthe, is a series of mazes. Your task is to get to the exit. However, at each intersection, your movements are restricted. There was another game very similar. It had a tank theme. This game has a lot of ads. 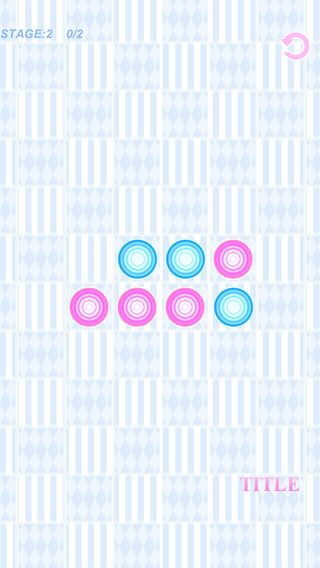 Flip Puzzle Game reminds me of the coins in a line bar bet. For example, suppose you have 3 nickels & 3 quarters: can you get all the nickels to one side by moving 2 coins at a time? Flip Puzzle Game is very similar. You must match the image on top by rotating - as a group - any number of sticks. For example, in the image shown above, the solution is to grab the 2 leftmost sticks and rotate them. There are 100 levels and I've only done the first 21. It's a great concept, but, like the coins in a line, I don't feel compelled to solve them all. Tentaizu is very similar to Minesweeper. The objective is to find all 10 stars. Naturally, if you see a Zero, tap all the cells around it once. If you can prove that there's a star, tap twice. I have not played Tentaizu much. The easy & normal levels are easy if you've already done hundreds of minesweepers before. The Hard levels - whoa - I think there's some guessing involved. Rubpix is another sliding tile puzzle. You must slide the rows & columns to match the image at the very top center. There are 150 levels ranging from 3x3 grids to 8x8. The concept is not original. We've seen this type of puzzle app at least 2 dozen other times. Nevertheless, the graphics are good and young puzzlers should enjoy this. Paper & Light has 80 semi-dark mazes. Your task is to find the exit. You will have to use your firefly to look around. At no time can you see the whole board at once. In addition, there is a sokoban element where you will have to move boxes out of the way. Unlike sokoban, you are permitted to move more than 1 box. Of the 80 levels, I've done 6 of them. Interesting concept. I had trouble sleeping the other night and started playing Fraud Tycoon. It's a Tetris type game. I've never liked Tetris, so I don't like this either. In fact, the graphics are too old-school.